When it comes to RVs, there are two main types of trailer hitches: bumper pull and gooseneck. Bumper pull hitches are what most RVers use when towing a recreational vehicle. Many SUVs, trucks, and even larger cars come with the ability to bumper pull a trailer from day one. Gooseneck hitches, or fifth-wheel hitches, use a heavy-duty system that fits into the bed of a pickup truck equipped to tow this way. You’ll see gooseneck hitches used on fifth-wheel and park model RVs. It's important to know which one is the right hitch for you. Most RVers choose bumper pull hitches because they're easier to start, and most trailers on the road use them. They don't need you to install more hardware, although you can invest in other bumper pull hitch system for better performance. Since you're dealing with a smaller RV or trailer to tow, you're spending less money to get started. If you're looking for a heavy-duty trailer or RV, most of them will need you to invest in a gooseneck hitch. A bumper pull hitch uses a traditional ball and hitch system to tow. 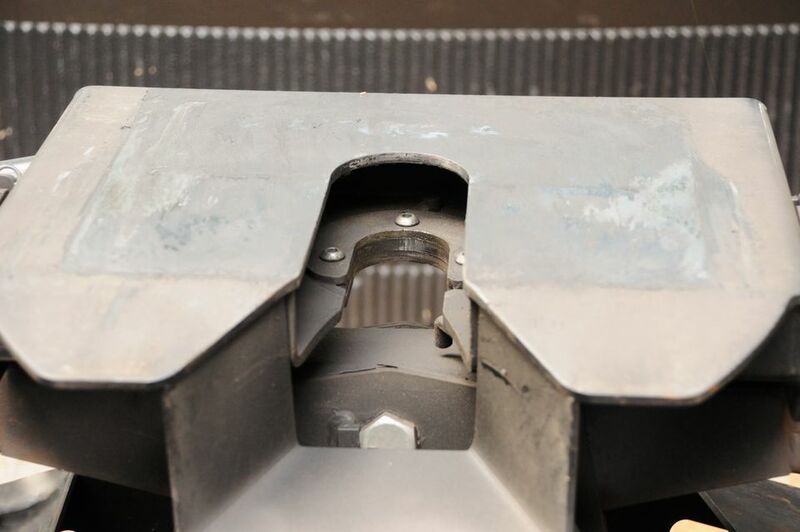 There are two types of bumper pull hitches: receiver and fixed-drawbar. Receiver hitches mount to the rear of a vehicle, and a ball mount can fit inside to secure the trailer to the towing vehicle. The fixed-drawbar hitch utilizes one solid piece, allowing a trailer ball into the hitch. The fixed-drawbar is ideal for towing long, wide trailers whereas you can use the receiver hitch for small trailers, cargo carriers, and bike racks. Bumper pull hitches aren't expensive. Most SUVs and trucks come with the basics you need to get started towing. In fact, when you buy a car that can tow, you’ll be asked about a hitch package at an extra cost by your dealership. From there, you add accessories to get the desired effects while towing. Consider doubling up on safety chains if you’re using a bumper pull hitch. This will offer an additional level of support should something go wrong while towing this way. Gooseneck hitches go by many names, including deck over hitches or fifth-wheel hitches. They're meant to tow heavy trailers, such as fifth-wheel RVs. The gooseneck hitch's main plate is attached to a truck's bed. The trailer or fifth-wheel hitch fits into it from above, eliminating the use of the bed in the process. This allows the truck to tow a trailer or fifth wheel with a higher weight class. Most trucks don't come with a gooseneck hitch installed, so this is an extra cost to consider when going with a gooseneck hitch over a bumper pull one. This is one of the reasons why this type of hitch and the fifth wheels that come with it are invested in down the line for RVers. Gooseneck hitches allow RVers to take tighter turns and control trailer sway easier than bumper pulls. With a bumper pull hitch, you'll need to learn how to turn so that you aren't taking out every car next to you. You'll also need to learn how to handle trailer sway depending on the conditions. While you still deal with sway with a gooseneck hitch, the weight of the truck helps keep the trailer or RV from swaying as much because of where its center of gravity is located. When it comes to cost, a gooseneck hitch will be more expensive than upgrades to a traditional bumper pull hitch. Gooseneck hitches start at a couple hundred dollars and can reach up to the low thousands. The cost depends on the type of RV or trailer you invest in, the towing truck you're using, and what type of gooseneck hitch you choose. Towing setups often double up on safety chains for increased stability and security. A gooseneck hitch is perfect for towing something much larger than a travel trailer, such as a fifth wheel RV if you need something bigger and better on the road. Choosing a hitch isn't as important as choosing the type of RV or trailer you want to purchase. Once you know the type of trailer that's right for you, RVing becomes more comfortable as you learn, grow, and adapt to your travels across the country. You can always take classes and get more comfortable with towing on the road. Consider a towing class for both hitch types to see what leaves you feeling more in control when traveling. Bumper pull hitches and gooseneck hitches serve their purposes, and one is not better than the other. It all depends on what makes you more comfortable behind the wheel and on the road. Is It Better to Back in or Pull Through at RV Sites?